Debería leer esta entrevista con Raoul Vaneigem. Debería leer esta pelea entre gatos que es la reseña entre Malcolm Gladwell y Chris Anderson. Debería estar escuchando este mix de Guido. Debería estar escuchando el mix de ambient jungle de Woebot para FACT. También debería estar escuchando el nuevo disco de estos alegres homófobos. El retorno del grupo surcoreano SNSD se ha visto salpicado por la polémica. En la portada del disco había al menos un par de elementos que dispararon los comentarios y la rumorología allá por donde aparecieran. Uno eran las insignias que llevaban algunas componentes del grupo en sus respectivas gorras, que al parecer de internautas y demás gente de mal vivir, eran nazis. El segundo era más doloroso desde la perspectiva nacional: el avión dibujado en la portada, dicen, era un bombardero japonés como los que se usaron en conflictos armados en los que murieron miles de habitantes. En realidad, la primera acusación es falsa (es una marca actual de insignias que no hace apología del nazismo). Y para la segunda al menos hay que estar un tanto predispuesto. De todos modos la agencia que lleva al grupo ha reaccionado con velocidad retirando de la portada todos aquellos elementos que resultasen molestos. Cambiando con photoshop las insignias y colocando un avión supersónico de tecnología nacional. La celeridad de este movimiento (que se traduce en el retraso de la publicación física del disco), ha reconfortado a la opinión pública que opina que todo esto podría haber acabado en un gran problema de imagen para e grupo. Eso sí, nadie pareció escandalizarse por el momento, cuando en plena escalada de tensión dialéctica y militar entre las dos Coreas, un grupo que con “Gee” estuvo nueve semanas en el número uno y que ya lo era con su nuevo single a la hora de publicarse, aparezcan vestidas en trajes militares, celebrando el capitalismo y preparadas para pilotar un avión que llevarán a cualquier destino que sea necesario. En estos momentos se desconoce si algún club de fans de algún artista o grupo contrario a SNSD ha declarado que sus vidas son prescindibles y es un deber de sus miembros el acabar con sus vidas. ‘OF’ AND ‘OF’. What is a sound ‘of’? We can pose this question by way of a further reprise of Art and Language’s development 1 of David Kaplan’s suggestive analogy between two distinct uses of names –descriptive and genetic 2– and two ways of understanding the ‘ofness’ of a painting. (In any case, it is a question that Florian Hecker’s work already provokes, whether in the form of a philosophical problem or in the immediacy of a spontaneous exclamation –‘WTF?!’). Like a painting, a sound can be ‘of’ x either in the sense that it resembles or represents x, or in the sense that it retains a genetic or causal link to x –even if, no doubt, these two types of ‘ofness’ are often intertwined and mutually complicated. As A+L argue, representative ofness –the connection between image and world– is never simply given, but depends upon the competences of the audience, who not only, as Duchamp pointed out, complete the work, but also play their part in configuring the image-world relation, partitioning the iconic and expressive aspects of the image according to their varying background knowledge and inherited techniques of seeing and hearing. With this insight, the normative myth of the ‘adequately sensitive, adequately informed spectator’ 3 able to read a work of art ‘correctly’ is exploded into a multiplicity of different historically-situated image-world relations. Does this prevent us from setting the boundary conditions for a ‘competent’ reading, consigning us to relativity and the impossibility of any critical discourse on what a picture or sound is ‘of’? 4 Not, suggest A+L, if we admit that representational ofness is parasitic upon genetic ofness. For the criticism would be re-grounded in the ability to detect and analyse the genetic bases of the work, and realism in techniques that clearly circumscribe the relation of the work to its genesis. Accordingly, against the notion that the ‘meaning’ of a work can be read off from its iconic content, the suppression of a work would only block access to a full sense of what it is ‘of’, in what A+L argue is ultimately an ideological obfuscation. Although preceded by comparable mechanical devices such as the planimeter and integrator –physical embodiments of mathematical techniques simulating a system governed by a differential equation, and designed to interact directly with continuously-varying physical quantities 16 –postwar analog computing emerged from the development of military control mechanisms. The incomparable success of electrical flux as a physical analog of the continuously-varying quantities of calculus, and analog systems’ consequent facility in solving differential equations and so simulating dynamical systems at a time when digital computers were taking their first baby-steps towards simple arithmetic, were swiftly seized upon by a nascent military-industrial complex. In the early twentieth century, tactical dominance had become less a matter of brute force than one of ‘information technologies’ in the broad sense. And just as, even in default of any satisfactory mathematical foundation, early differential calculus had immediately been put to work in directing cannonfire, early analog computers would be eagerly deployed in the preparation of ballistics tables, in aeronautical and missile design, and in conducting ‘virtual laboratory experiments’ where real-world field trials would have been prohibitively expensive or dangerous. However, as electronic instruments developed during the latter half ot the twentieth century and entered the mainstream consumer market, the analogical impulse was never far away. And by the eighties, the capacity of analog machines to synthesise sound from the ground up was threatened by digital computers’ rapidly-evolving ability to code and reproduce recorded samples of acoustic instruments. Indeed, the market made its will known against the intransigent analog bias of a man like Roland president Ikutaro Kakehashin. Completing the transfer of military-industrial technology to the burgeoning media-entertainment complex, Kakehashin oversaw the production of Roland’s 303, a bass guitar simulator which, famously, failed miserably in the marketplace, and found belated success only years after being discontinued, when producers misused the controls intended to fine-tune the simulated bass guitar, instead tweaking the 303’s voltage control filters to explore an abstract sonic space. The 303 inadvertently released, as a kind of ‘machinic surplus value’, the possibility of a variation-in-motion: The parameters that were meant to be adjusted judiciously to achieve a serviceable representation were instead tweaked ‘in-flight’ to create outrageous sounds abstracted from all resemblance to any earthly musical instrument. 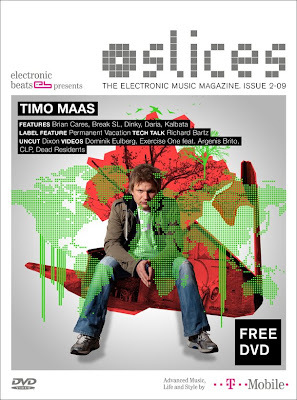 But the progressive refinements achieved by 303 bass science, still vital to the bass phylum of dance music today, remained bounded by certain conditions: Pharmacological effects and crowd response, the rave interface, ‘a deployment of technologies –musical, chemical and computer –to deliver altered states of consciousness’. 22 This ensemble installed its own differential features in the continuous, flat parameter space of the device, producing a ‘landscape’ inclining it to certain paths, inviting the human hand and ear to identify and revisit more intensely sensitive zones and refrains, and finally locking the device into a recognizable genre. Hecker’s experiments, automating the sonic probe-head of the analog synth, not only widen the possibilities beyond the 303’s singular but relatively restricted sonic territory; they also release the analog synth from this habitual retreading of hunting-grounds governed by human proclivities. Instead they reveal to us the weather-patterns native to this space. What is a sound ‘of’? What is a sound? The landscape is subjected to a mobile differentiation; weatherfronts approach and pass, meterological catastrophes play out in a turbulent atmosphere. ACID AND TUDOR. If ‘acid house bypassed verbals altogether and proceeded to what felt like direct possession of the nervous system via the bass-biology interface’, 24 Hecker undertakes to scour away the residual figure of the human, brutally deterritorialisng the landscape with his inclement climate changes. Acid and rave culture had operated an escape from physical analogy but only to become lodged in a more profound complicity with a pharmacologically-morphed image of the human (dance and bi-lateral symmetry, the mutual catalysis of electrocortical stimulation and the effects of amplified sound). Whereas on the other side of the dilemma, David Tudor’s Neural Synthesis –perhaps the piece closest to Hecker’s Acid…, and which allowed us to hear the slurping and screaming of neurons –still used its advanced (digital) technologies to operate an analogy. Representational ‘ofness’ demands further incapacitation, a further effort. The titular joke, of course, is that the turbulent adventures of these chaotic patterns seem to ape the metallic, nasal yelps of a 303 gone psychotic, the irresistible associations of its elastic, corrosive analog squawk giving rise to “an ironic stylistic détente between supposedly incompatible aesthetic and ideological worlds’ 25 of the sort that A+L proposed with their ‘Portraits of V.I. Lenin in the Style of Jackson Pollock’. So that although, in line with Hecker’s aggressive hypermodernist agenda, Acid in the Style of David Tudor is governed by an absolute ‘genetic realism’, it simultaneously brings into play an ironic ‘resemblance’: In returning to the virtual laboratory environment of the analog synth, Hecker discovers the ‘single and synchronous surface’ upon which ‘incommensurable mythologies’ –those of rave culture and high musical modernism –can be ‘forced into momentary coexistence’. 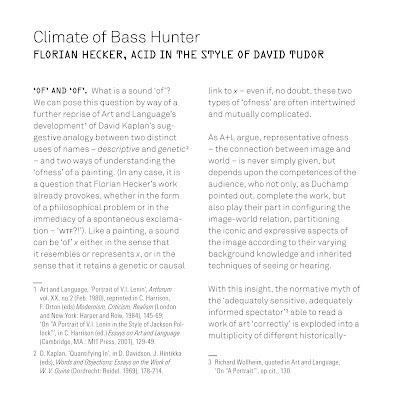 26 Nothing could be more apt for an artist such as Hecker, as steeped in the chill air of Darmstadt as he is passionate about the affective power of the bass rig (as anyone attending his live performances will know). And in fact, upon retrospective examination, don’t the baroque, psychedelic visualisations of Mandelbrot sets that graced many a rave flyer seem to augur this ‘monstrous détente”, 27 indicating before the fact the strange conjunction to which Hecker introduces us? Their image-exploitation is suggestive in regard to the ecstasy experience, ‘infused with an intensity of meaning’, 28 operating within an imaginary of spontaneous, tribal unity, and its production of a collective representational ‘ofness’ that obscured more profound genetic continuities: Possibly as few ravers suspected their phuture sounds were descended from military hardware as appreciated the mathematical significance of the paisley-patterned fractals that stimulated their visuals. SENSE AND NONSENSE. The audible continuum may be operationalised as a continuous mathematical space. But at the same time it is also the aeonic plane where infinitives dwell: to cackle, to rush, to gasp, to whirr, to click, each one describes a vague but definable set of routes upon the virtual surface of sound. With exponentially-accelerating digital technology finally able to produce ‘digital analogies’ such as the BassStation and Rebirth, over the last decade basshunting has been take up with renewed enthusiasm, and new territories have proliferated: Dread bass, rude bass, sick bass … language struggling to catch up, and sometimes lapsing into proper names, like flags planted in the sonic soil: Basses ‘signed’ Doc Scott, Ray Keith, Ed Rush. With regard to this indexical adhesion of infinitives to itineraries in sonic space, in the present case we can only follow Lewis Carroll in speaking of gyring and gambling. For Hecker’s chaotic climates belong to the virtual reserve of nonsense from which sounds that make sense are selected. His experiments cut across these biologically –and culturally –determined territories, producing nonsensical sound-images. Now, as A+L write: ‘Alike, the unironic art-historical theorization of the artistic image and the unironic psychoanalytical theorization of the joke lead to that dark wood where Alice Stared, outfaced and solemn, at a catless grin’. 29 That is, aetiological investigation –the primacy of genetic ‘ofness’ –might seem to run the risk of ending up dissolving every face, every image, into vacuous nonsense, vapourising it in the act of analysis. But in the practice nonsense is always richer than this would suggest. For ‘the ambition to produce an “unaesthetic art”’ 30 backfires in a strange way. A+L had premised their experiment on the principles that the modern audience is required to be competent in ‘second-order’ discourses, 31 and that the supposedly spontaneous first-order experience of art is never as simple and unmediated as might be supposed. But the experimental suppression of aesthetic criteria ended up producing a ‘new aesthetic’. 32 In the process of impassively manufacturing the Lenin/Pollock ‘portraits’, A+L ‘discovered that some were better than others’ and found themselves engaged in some kind of first-order practice after all. 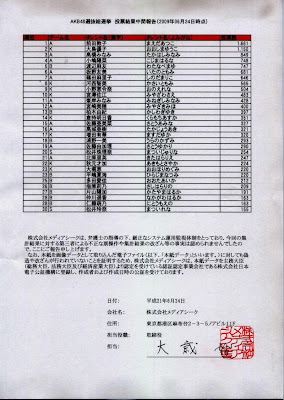 33 It seems that however efficiently evacuated, ‘content’ can still enter by the backdoor. Second-order conceptuality leaks out into first-order content, transforming it, crystallizing into ‘a transformed aesthetic practice’. 34 Similarly, do not doubt that Hecker has meticulously selected, edited, and spliced the results of his chaotic experiments in order to present us with the dramatis personae of Acid in the Style of David Tudor. But far from invalidating the genetic approach to ‘ofness’, the novelty of this continual supplementary production –the end products of an austere break from first-order ofness becoming once again ‘first-order productions of a kind’ 35 (but of what kind?) –demonstrates the break’s productive, stratifying or differentiating power. This unanticipated experimental outcome can be considered in terms of the famous Bergsonian dichotomy between space and duration, between the analytical mind’s spatialisation or mathematicisation of phenomena and the lived aesthetic experience of duration whose dense coagulation dontes sense or meaning; between the interior ‘ofness’ of lived experience that conditions judgements of representation, and the genetic ‘ofness’ of the physical causality of sound. Against the psychophysics of his contemporaries such as Helmholtz and Fechner, Bergson denied the adequacy of the waveforms described by science to the lived experience of sound, of which they could, he insisted, only ever be an external and abstract index. 36 Not coincidentally, it was against the legacy of Bergsonism that Bachelard directed his analysis of science as a series of ‘epistemological breaks’ from the self-sufficiency of the ‘immediate givens of consciousness’, an analysis to be radicalised by Althusser into the militant struggle of science against the obfuscatory mire of ‘spontaneous’ ideology. But, as we learn from A+L’s Lenin/Pollock experience, such second-order scientific breaks, with their associated techniques, obdurately and stealthily (‘(…) sneaked up on us (…)’) 37 give rise to new aesthetic experiences poised on the borders of sense. In discussing the dilemma of the ‘two realisms’ which the Lenin/Pollock détente set out to dramatise –that of the ideological delusions of post-painterly purity (the painting is ‘of’ the internal energy of the heroic artist) and socialist realism (the painting is ‘of’ an objective social reality) –A+L indicate that the turn toward genetic ofness offers no simple synthesis or resolution of this polarity, but instead furnishes the programme for an experimental ‘collision’ 38 that forces open the problem, simultaneously releasing a new bloc of aesthetic energy: ‘Action in the face of dilemma involves commitment to a more-or-less unpredictable outcome’. 39 A clinical cut into the body of sound at the site of an impossible conjuncture, a sensory experience ‘wrought from the world of the “unasthetic” to unleash new adventures in the bass-biology interface, it is such an ‘action’ that this recording is ‘of’. 19. See R. Spiess, ‘The Comdyna GP-6 Analog Computer: Alive But Not Exactly Kicking’, in IEEE Control Systems Magazine Vol.23, Issue 3 (June 2005), 68-73, for a reflection on the continuing value of the analog computer in engineering education. Se crea una sensación de pertenencia a una comunidad, el ser la última manifestación de una problemática ya conocida que viven todos aquellos que pertenecen a aquella, llamémoslo adolescencia, que es a la vez un gesto de individualidad y una derrota de la misma, mediante el uso de la nostalgia ¿o es al revés? Pues nada, ya sólo queda poner las actuaciones, saber si las ventas superan las 100.000 copias y en dos semanas saber los resultados de las elecciones. El misterio de los círculos que aparecían en los campos de amapolas del sur de la isla australiana de Tasmania se ha resuelto: son canguros colocados que se comen las flores de amapola y corren en círculos. "Tenemos un problema con los canguros que entran en los campos de amapola, cogen un subidón importante y corren en círculos", explicó el jueves la principal legisladora del estado, Lara Giddings. "Después se quedan dormidos. En la industria de la amapola, vemos círculos en las cosechas de canguros colocados", añadió. Mucha gente cree que los círculos que aparecen misteriosamente en cosechas de diferentes partes del mundo están creados por alienígenas. La productora de amapola Tasmanian Alkaloids señaló que se sabe que los animales que comen amapolas, como ciervos y ovejas de las tierras altas de la isla, "actúan raro". "Ha habido muchas historias sobre ovejas que han comido algo de amapolas después de la cosecha y todas andan en círculos", comentó el jefe de operaciones de campo Rick Rockliff. Australia produce en torno al 50 por ciento de la materia prima para fabricar morfina y otros opiáceos. El set de Joker en el Sonar, cortesía de él mismo. - ¿Tenéis papel de liar? Una entrevista posible algo más larga y menos divertida con King Midas Sound. “Todavía me aferro a la idea de que la teoría y la práctica van unidas. No considero que mis libros o mis conferencias sean actividades separadas de mi trabajo como guionista o como director. En mis ensayos sobre el contravine, intenté realizar el trabajo preliminar para un cine experimental que resultase oposicional tanto en forma como en contenido, en significante y en significado. Con Laura Mulvey, comencé a hacer películas, películas experimentales; como dijo Serge Daney, en otro contexto, Eisenstein más que Pudovkin. Después de mayo de 1968, parece que también Daney podía haber acabado como cineasta de vanguardia, haciendo un tipo de película muy similar: fue uno de los componentes del grupo de cineastas parisinos que se reunieron en torno a Silvina Boissonas, un grupo en el que se incluyeron Philippe Garrel, que, según Daney, ha sido “el mejor”. No estoy de acuerdo. Creo que Jackie Raynal fue un cineasta mucho más significativo, un pionero de la toma larga no editada, y yo prefiero la obra de Boissonas a la de Garrel. Tristemente, Daney abandonó la realización de películas por el viaje, por convertirse, como él dice, en la estrella desconocida de una película solipsista que nadie sino él llegaría a ver, que sólo se podía entrever mediante las postales que él enviaba a sus amigos, desde las localizaciones de rodaje, por así decirlo. Daney consideraba a Staub-Huillet y a Godard-Miéville como los cineastas ejemplares de su generación, y luchó, en sus escritos, por evitar que los marginasen”. Suponemos que la elaboración en forma de libro de las lecturas disponibles en su blog. Un documental de una hora de duración, entretenido más que esencial que tiene su mayor virtud mostrar al menos vivos a dos de los compositores, opinando y explicando sus ideas (Harrison murió hace algún tiempo), que simplemente muestra la obra de tres compositores que ellos califican como “outsiders” norteamericanos, con influencia y conexiones directas entre ellos, aunque pertenecientes, como ya saben a esa corriente de compositores que podríamos englobar bajo la etiqueta “american mavericks” que van desde Henry Cowell y Charles Ives a John Luther Adams o Peter Garland pasando por Conlon Nancarrow, James Tenney o La Monte Young. Cowell aparece de pasada, aunque la influencia de su libro es un poco más extensa del tiempo que aparece en pantalla (sin querer restar méritos al texto de Partch). Agradable de todos modos. 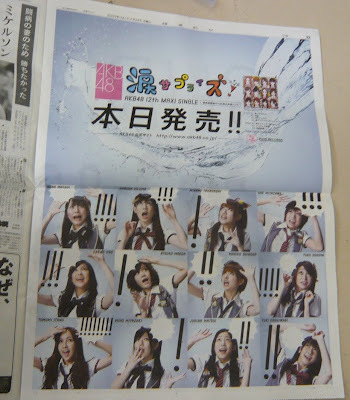 Siguiendo con las actividades de AKB48 durante esta semana, comprobamos que la campaña publicitaria en el periódico continúa. Estos son los anuncios que se han ido publicando diariamente y el inserto correspondiente al día de hoy, con las imágenes antes y después del agua. Una de las fórmulas para aumentar las ventas son las fotos “extras”, que dependen del lugar donde uno compre el single (no tengo ni idea de si yo conseguiré una). Obviamente las participantes en el nuevo single son las 21 primeras, mientras las siguientes de la lista hasta llegar al puesto treinta forman una unit con canción propia. Fíjense en las ventas que han obtenido el grupo en el tercer puesto. El número uno en Japón hace dos semanas lo consiguió Girl Next Door con unas ventas alrededor de las 31.000 copias. El de la semana pasada, V6, lo hizo con 64.000 (una cifra que seguramente superará el single de las chicas). De modo que el número uno corresponde a un famoso de televisión fijo en uno de los programas de moda por allí, que tiene el blog más popular de ameblo.jp (un sitio lleno de blogs de famosos cuya popularidad depende del número de comentarios por entrada que recibe durante la semana, la última entrada de este caballero supera las 4200 respuestas), en teoría por estar lleno de fotos de gente famosa. 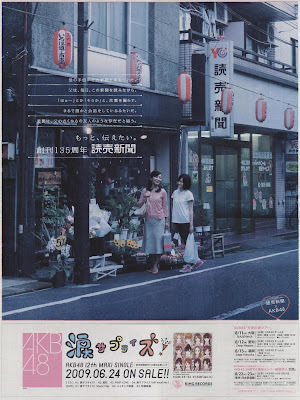 Y sí, el single convierte el de AKB48, que no es precisamente su cima artística, en obra maestra por comparación. En realidad, me da igual quien sea el número uno, pero me aburre tanto grupo y artista masculino cortado por el mismo patrón (1, 2, 3). Cuando Mano Erina apareció en Music Station, era la única chica artista (había una cantante pero de comparsa con un DJ con una versión de Mariah Carey). Todo el público era femenino. Tampoco es que fuera una excepción. Quizá tenga que ver algo con el concepto de masculinidad japonés. O con el hecho de que Japón es gobernado de manera casi ininterrumpida (algún año no ha sido así) por el mismo partido político, el conservador LPD, aunque es algo que seguramente cambie este año donde ganará el partido liberal DPJ, en la práctica indistinguible del anterior. De modo que lo resumiremos en “mierda”. No, en serio. Castración química, ya. 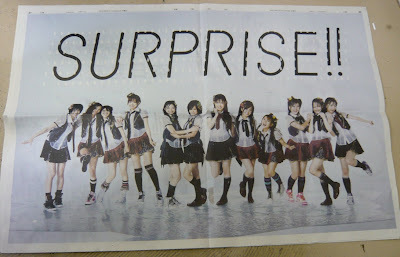 Morning Musume – 3,2,1, Breakin’ Out! Lo nuevo ¿de? Greil Marcus.